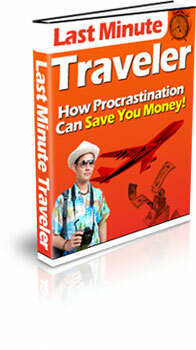 If you still think that you have to pay higher prices for last minute travel deals, think again. No more higher prices on places that you want to go to at the spur of a moment. Maybe you're bored and need to get away from your familiar surroundings. Or you just want to go somewhere and do some things that you've never done before. However, you feel that since this is a last minute effort, that you won't have enough money to do it. Don't despair, because those days are over.